S.H.I.E.L.D. : The Strategic Homeland Intervention, Enforcement and Logistics Division. Earth's Watchdog organization, S.H.I.E.L.D. uses cutting-edge tech and espionage to eliminate threats before they emerge. There are no secrets from S.H.I.E.L.D., no superhuman risk too great. 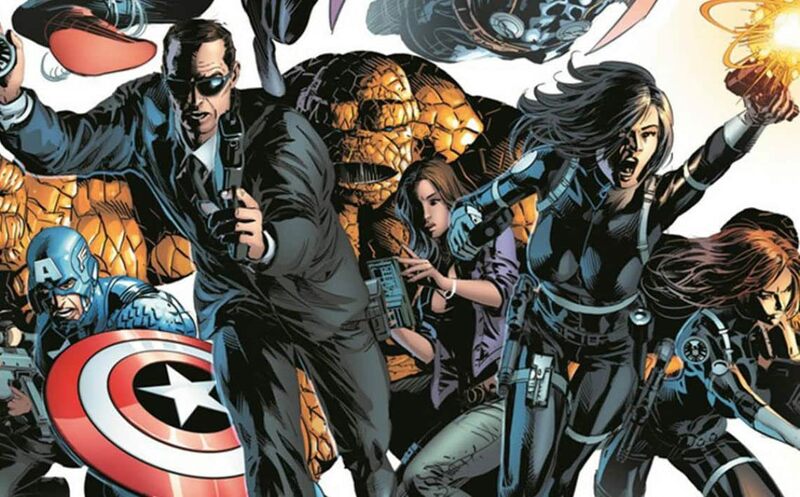 Check out our counterintelligence files, outlining S.H.I.E.L.D. history and current operations. Our full dossier on S.H.I.E.L.D.. Including their first appearance in Strange Tales #135, to the recruitment of Spider-Man. S.H.I.E.L.D. 's rise in power chronicled. Check out Nick Fury in one of his earliest appearances as he takes down Scorpio alongside Dum Dum Dugan and 'La Contessa'. A retro throwback to a 60's spy caper! The Helicarrier is not only a sweet ride; it's a symbol of S.H.I.E.L.D. 's prominence and ability to protect. When Red Skull commandeers S.H.I.E.L.D. 's base of operation, Captain America must take it back. The highflying Helicarrier repurposed as a submarine! Captain America attacked by S.H.I.E.L.D.! During Civil War, S.H.I.E.L.D. sided with Iron Man's Pro-Registration faction, believing unregistered heroes to be vigilantes. Director Maria Hill pulls no punches as she uses excessive force against former ally Cap. The Marvel Universe at its most dysfunctional. Sharon Carter is Agent 13, field operative and spy extraordinaire. In this Civil War tie-in, Agent 13 must choose between her boyfriend Captain America, and her executive position. Not an easy choice given the circumstances. An inside look at S.H.I.E.L.D. 's directorial operations. In the Ultimate Universe, S.H.I.E.L.D. is the impetus behind the Ultimates team. Nick Fury recruits a group of heroes to protect and serve mankind. Witness the first meeting of the Ultimates at the impressive Triskelion base. S.H.I.E.L.D. takes Captain America 'off ice' after a 60 year hiatus. Iron Man: Director of S.H.I.E.L.D. After their controversial involvement in Civil War, S.H.I.E.L.D. underwent a change in management. Maria Hill was ousted as Operating Director, while Tony Stark stepped in. Iron Man Director of S.H.I.E.L.D.! First order of business? Better employee benefits! The shapeshifting Skrulls unleash a neuro-virus in S.H.I.E.L.D. 's operating bases. The Helicarrier is in DEFCON 1 as it hurtles towards Manhattan. The invasion has begun. Daisy Johnson: Director of S.H.I.E.L.D. Nick Fury finds his replacement in Daisy "Quake" Johnson, leader of the Secret Warriors. Daisy may be well-suited as 'Director of S.H.I.E.L.D. ', but will she be able to reunite her team? A new beginning for S.H.I.E.L.D. 's elite task force. An unconventional crew of covert operatives joins the fight for humanity in this ongoing series. A new alliance is forged between the Avengers and S.H.I.E.L.D.. The Secret Avengers' first mission? Infiltrate a Russian bathhouse. High-tech weapons. High-stakes missions. High-octane adventure! For the men and women of S.H.I.E.L.D., it's just another day in the field! Special Agent Phil Coulson brings together the best and the brightest, the gifted and the elite, normal people and superhumans from across the Marvel Universe on an as-needed basis to confront, combat and curtail dangers beyond the scope of any conventional peace-keeping force!